Jake is living his passion...saving wild fish and the water that they call home; He married the love of his life on top of a mountain in southeast Oregon. I am lovin' learning to live when everyday is a Saturday. Health is good. A smile is forever on my face. Lucky to still have my mom with me - 88.5 years young. Making memories and remembering the memories of old. Gardening, making candy, playing with the pups and just enjoying each new day that I wake up to. Bobby and I continue to hold heart & hands, climb onto the motorcycle, make merry and are looking forward to when Bobby is also retired. New free time passion ~ Bobby and I jumping on the back of our Victory motorcycle, and cruising the back roads of Colorado and beyond. Taking a break (way too long of a break) from packing for our road trip to the 75th Anniversary Sturgis Road Rally - we leave tomorrow. We will be the ones with helmets, boots, leather chaps, obeying the speed limit but watching the crazies. If you are into people watching - you will see E.V.E.R.Y.T.H.I.N.G there! I love reading everyone's profiles and catching up with your lives. Looking forward to our 45th Reunion. Thanks to everyone that is working hard on the event for all of us to enjoy. You are appreciated! My new passion is as a candy maker. Check out my facebook page - judycakes candy. Caramels (not the break your teeth kind), hand dipped chocolates, fudge of all kinds - root beer float is a fave, new recipe is Big Hunks and my MOMmallows (marshmallow) - Plain Jane and ones covered in Toasted Coconut. Yum! My chores are calling. See you soon! 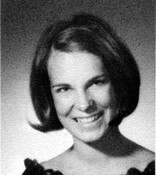 You don’t know this about me but I was engaged at graduation and married on August 28, 1970. Thanks for throwing me this big party. Oh yeah, I didn’t invite that guy to this fun full weekend…that marriage ended. Let the story begin…my mom always told me to write a book. I met this handsome, dark haired guy driving a cute red Fiat convertible who was traveling through SLC. As it turns out, SLC was his last stop. My dad struggled letting me drive off in his “hippie van” (Fiat broke down and next was the hippie van) as I moved to Iowa. Iowa was home for 1 short year and then we landed in Lincoln, Nebraska. Tidbits about that era -tried to raise a “wild” coyote as a house pet in Lincoln, worked as the head cook/manager of a unique vegetarian restaurant in “meat & potatoes” Nebraska country. My claim to rock n roll fame was I planned and cooked the pre-concert meal for YES on a concert stop. The 80 acre farm outside of Lincoln came next; living with us were 3 goats, 3 sheep, a blind horse, 8 “girl” cows plus lots of chickens. It was my job to go to the farm store to pick up the baby chicks. I came home with 100 baby chicks. Too small for the chicken coop so they lived on the floor of our bathroom for longer than was fun. We had two Canada geese and when one hurt her wing, she couldn’t be outside so she lived in our bathtub for a year. Good thing I like showers - lots of showers. You never knew who or what was living in our house – imagine going into the bathroom and being very CAREFUL so you didn’t disturb the Canada goose in the tub right next to you while you sat on the toilet. Or, can you visualize the sight of me taking one of my goats to the vet in the back seat of my VW bug and her head out of the window. Wood Stove Company was next on the agenda. We opened Wood Stove Company in the mid 70’s during the oil embargo, 1st one store and then two. Being one of the first dealers and of course, having all of the best models for sale…this was a business ripe for the season. Somehow 10 years later - running the farm and the stores, our love ended. Back home in SLC, starting over, I got the job of my dreams. Still to this day, my favorite job has been being the head baker/bakery manager/pastry chef at Little America Hotel. Baking volumes and volumes of goodies every day was the life. Wouldn’t you know it another chance encounter with a cute guy captured my attention. Someone we all know and love. He will remain nameless to protect the innocent. My feet & heart turned to San Francisco, CA in early 1983 for my next adventure. Loved San Fran, working on the wharf, being on the fringe of the actor’s world of the Bay area was the best. But different ideas, different space became evident again and onto the next adventure I would go. Best thing in my entire life was my son Jake was born in San Fran in 1985. Then we (Jake & I) were back home again but this time, it was Denver. Denver is where my life came together – started school to learn about the graphics and printing field. A friend set me up on a blind date in 1986. Bob was the date. Different than my other entire list of boyfriends; quiet, conservative (heavens forbid), mostly Republican, and nice. Very nice! November 28, 1987, Jake & I married Bob and became a family. Working hard, loving, watching Jake grow into the young man he is today-bright, handsome, big heart and doing the education direction that I always wished I had done. Our family fun was canoeing (once Bob and I learn that the canoe ride is better when the boat is upright with all 3 bodies still sitting in the canoe) the rivers of Nebraska, Wyoming, and Colorado. A hard lesson for me to learn was that the person in the back was really in charge not the one in the front. But when your 5 year old wants his own boat because he is tired of swimming, canoe lessons were next. I decided that Bob could be in-charge in the canoe; I could still be in-charge at the camp site, in the car and at home. Life is good! Soccer became big in our lives. I started playing at age 35 when I moved to Denver and continued until I was 50. Jake started at age 4, competitive traveling teams through his teen years and varsity as a freshman in high school. West Virginia for soccer and college but injuries forced him back to Denver. Boys, boys and more boys…we invited our first German boy exchange student into our home and hearts when Jake was a senior, then the English lad that needed a R & R after a soccer career ending injury; we go from one boy to 3 teen age boys in the matter of days. We follow with two more German boy exchange students, this time coming singly. We now have 1 + 4 add’l boys that we love dearly. This is getting too long so I will end now with many more stories to share at another time but the most important bit of info. Bob is not so quiet, not so conservative, more Democrat and even nicer, sweeter and more of a best friend than I ever thought was possible 24 years ago. Plus he is really cute! Recently when the reunion buzz started I checked out the yearbook and was surprised to see that we had soccer back then. My hat is off to all of you on the soccer team. Wish I knew then what I know now about soccer. I would have been your biggest fan. Judy Cheever Crawford has a birthday today. Judy Cheever Crawford updated profile. View. Judy Cheever Crawford has left an In Memory comment for Thomas McGhie. I am so sad to read this. He will always be Tommy to me. Growing up, we lived a couple of houses apart on 3080 East; and ALL of my memories of playing with kids from the neighborhood, included Tommy. I have told & retold many funny stories of that time; growing up as a "tomboy" with only boys to play with in the neighborhood. Ever since I saw that he went to the last "unofficial" reunion (and I wasn't there), I have been hoping to catch up with him at the next reunion. Judy Cheever Crawford added a photo to profile gallery. Judy Cheever Crawford changed profile picture. Judy Cheever Crawford changed "Then" picture. New comment added. Judy Cheever Crawford added a photo to profile gallery. New comment added. Judy Cheever Crawford changed "Now" picture. New comment added. Judy Cheever Crawford has a birthday today. New comment added.